Fowey holds a special place in Jan's heart ~ it started over 25 years ago and it is very much her second home. A superb natural harbour the tidal estuary is a unique coastline surrounded by breathtaking scenery ~ an artists paradise! The GALLERIES below feature some of her work from recent exhibitions for sale either direct from Jan or exhibited and for sale at the The Clementine in Fowey. Included in the galleries are some of Jan's new work inspired by the Isles of Scilly with it's warm clear lagoons and white quartz sandy beaches. Oils with glass beads and opaque flakes reflect the truly glittering light on the jewel green shallows. 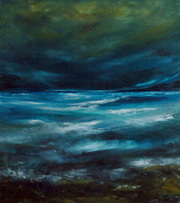 Light, the Sea & Sky inspired by Jan's passion for Du Maurier ~ the sea after a stormy night, foamy waves rearing and sprawling over glistening rocks, ever changing from vivid blues to emerald green! Many hours of fine blending create the ethereal quality and silky, marbled finish that now make Jan's work so desirable. The Black & White Gallery focuses on creating light through the use of glass beads with particles of sand and fragments of broken shell collected from the estuary form glistening rocks of seaweed and anemones ~ texture of the inshore!